Charizard is a Stage 2 Fire Pokemon, 160 HP, with a Water Weakness, no Resistance, and a Retreat Cost of 2. 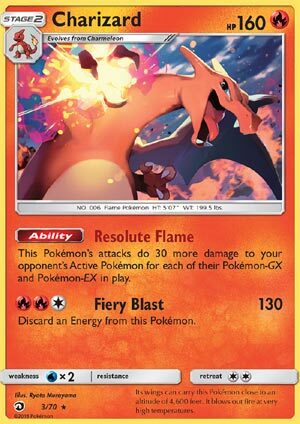 Resolute Flame is the Ability that gives Charizard an extra 30 damage for each and every one of your opponent’s Pokemon-EX/GX in play, while his Fiery Blast attack is a 3-for-120 that discards an Energy from him. Needless to say, it’s hard not to turn a head at the Resolute Flame Ability. With 1 EX/GX in play, Fiery Blast deals 150 damage, and with 2 in play, it’s dealing 180 damage. Put up the whole 6 extras, and Fiery Blast is dealing 300 damage – which puts this Charizard on-par with the likes of…well, M Charizard-EX. And M Rayquaza-EX too. But that is such a rare scenario that you’d end up with that many EX/GX in play; it’s more likely to be around 2-3, which is still enough in most cases. So how do we get our Charizard out and fully pumped up? Well the Charmeleon in this set provides one answer, where its Burning Fighter Ability mills out 5 cards but then attaches all the Fire Energy to itself. This can set you up for a powerful Charizard already fully charged and ready to use his attack twice on the next turn. That does however require you play the full line-up of Charmander, Charmeleon, and Charizard, which is already a lot of pieces to throw together, and on top of all of that, you need to be able to have a large amount of Energy so you can successfully mill it out with Burning Fighter. Never mind the need for your opponent to actually play EX/GX, which while that’s not necessarily something that’s not gonna happen, it’s also something that has a distinct possibility to happen – especially considering GX can be Evolutions, so they might not even come into play right away. That being said, you’re likely to be hitting for pretty good damage with Charizard, so it’s a matter of working around the hurdles as usual – figure out the ratios of your deck, the evolution bit (where you could sacrifice the Energy of Burning Fighter in favor of a faster Rare Candy), and potentially working around the discard effect of Fiery Blast – don’t think I didn’t forget about that. With the right balance of sorts, you may end up with a real winner on your hands! Arora Notealus: Charizard boasts a lot of power, as usual, but now he’s got the edge on EX/GX with his Ability. To top it all off, he can get boosted by Choice Band, and he only trades out for 1 Prize rather than 2, which is a great quality to have. I imagine that if a deck springs up around Charizard here, it’ll likely have a more local impact than anything major, but you never know – there could be a winning formula there. Weekend Thought: What’re your thoughts on this week’s cards? And what about Dragon Majesty as a whole? Are you a fan of these occasional subsets that come out? Do you like the cards that come in these sets? How do you feel about Dragons in the TCG? Love em or hate em? Today is the day I’m going to get as many Sylveon-GX tins as I physically can since the Eeveelutions tin came out. To end the week, we’re looking at Charizard (Dragon Majesty 3/70) as I had this as my 4th place pick due to being a self-serving Pokemon that strives to be a counter against certain cards. Actually, not a counter per se, but something that discourages your opponent from playing too many of certain cards. Before it can eventually do that, it requires some work to get there; in Charizard’s case, being a Stage 2 is burdensome, needing couple pieces of evolutionary lines plus Rare Candy to eventually get it in play. Other attributes may contribute to matter in regards to attacking; it is a Fire type with 160 HP, weak to water, and a retreat cost of two. The heart of the card lies on the ability called Resolute Flames. It states that this Pokémon does 30 damage to your opponent’s Active Pokemon for each Pokémon-EX and Pokemon-GX your opponent has in play. This can range between zero to 180 extra damage (270 damage if Sky Field is present with nine EX/GX Pokemon your opponent has). Keep in mind that Charizard can hit any Active Pokemon for extra damage, regardless what kind of Pokémon it is. All in all, this Ability has potential as long as this Pokémon has attacks worth using. Looking straight away, Charizard has Fiery Blast, which costs RRC for 130 damage, with an energy discard from that Pokémon. In isolation, this attack barely cross the 2HKO threshold that can be amplified further with Choice Band and however many EX/GX Pokemon your opponent has in play. Based on printed HP scores, facing a lone GX/EX Pokemon head-on means 190 damage with Choice Band, enough to OHKO most Basic EX/GX Pokemon. To OHKO Stage 1 GX Pokemon, you need your opponent to have at least two EX/GX in play. As for the OHKO anything territory, you’ll need your opponent to have at least three GX/EX in play. The energy cost isn’t easy to meet outside of Kiawe to grab four Fire energies and attach it to one of your Pokemon, at the expense of ending your turn. However, there is Charmeleon (Dragon Majesty 2/70) that has an ability that discards the top five cards of your deck. If any of them are fire energies attach them to this Pokémon. Seems like Charmeleon has a nifty trick to help meet Fiery Blast’s attack cost. As always, you might whiff on not getting any energy at all and lose crucial cards that you might need later on. But what if you don’t want to use Fiery Blast? Then you have to resort to cards in the Expanded card pool, specifically Charmander and Charmeleon, backed with either Shrine of Memories, Celebi-EX, or Shining Celebi, as they let you access attacks from previous Evolutions. I won’t be going through all Charmander and Charmeleon related cards, but to mention some that might caught me eye. For Charmander, there’s Playful that cost RC and does 20 damage for each damage counter on this Pokémon if you flipped heads, because tails does nothing. For Charmeleon, besides the latest one, there’s Raging Claws that does 50 for RCC plus 10 more damage for each damage counter on this Pokémon. Unfortunately, the rest of the attack choices are underwhelming that it is better to just stick to Fiery Blast. So how do you use Charizard? Not much of a surprise but Charizard should the focus of its own deck. You won’t have much room for other Pokémon and you don’t want other Pokémon taking Charizard’s responsibility away. Expanded has Blacksmith since he grabs two Fire energy from the discard to one of your Fire Pokemon, and with a manual attachment, you can actually go from zero to attacking. But then you have to deal with ability lock via Garbotoxin, shutting down your bonus damage capabilities. Standard also has Ability lock, but mostly against Basics (Alolan Muk) and all EX/GX Pokemon (Glaceon-GX), so non-GX Stage 1 and Stage 2 are safe! So when it comes to scoring, I would call it even. There is no Prerelease regarding Dragon Majesty since the pack can’t be sold on its own, rather you buy promotional boxes that contains them. If it were to be Limited, then Charizard is a pain to sent out, most likely because you would spend two turns evolving AND attaching an energy to this Pokémon. Without Rare Candy in this set, you may be out of luck if one of them is prized. Conclusion: Charizard is one heck of a EX/GX hate card, but that could be enough to see some use on a dedicated Charizard deck. Even without opposing EX/GX Pokemon in play, you’re still left with a solid 2HKO attacker except when facing a water deck, because they’ll hit you twice as hard which would mostly OHKO Charizard. Charizard (DRM 3) blazes its way back into the Pokemon Trading Card Game in the Dragon Majesty expansion set. This Stage 2 Fire type Pokemon will dominate against GX heavy decks and punish players who bench Tapu Lele GX’s because of its attack, Fiery Blast – which for three attachments (2 Fire 1 Colorless) does 130 damage – AND its ability Resolute Flame, which increases its damage to the active Pokemon by 30 points for each GX Pokemon your opponent has in play. The first time I attacked with Charizard, it was against Lurantis GX, and my opponent had Zoroark GX’s and Tapu Lele GX’s all over his bench. I did 680 damage (including weakness), and went on to steam roll over his deck in the next two turns. And then I faced non GX archetypes in the next four matches I played and didn’t have much of a chance in any of those games. It’s pretty clear that if you’re going up against GX decks, you’re going to be more than competitive with this deck. Against non GX archetypes? Eh… not so much. I’ve detailed out recently on PDC how often I see GX and non GX decks on PTCGO, and I’ve summarized the decks that have had top finishes in the first three tournaments of the year as well. On PTCGO, it’s about 3 out of every 4 decks are GX archetypes; IRL, 6 out of the top 8 decks in Philly were GX decks, although non GX archetypes did dominate the week before that in Brazil, taking the top seven spots in the event. Still, Charizard should do alright for you… I just ran into some unlucky matchups, including one against a Water deck. Hopefully, you’ll have more luck with this deck than I did. You probably will, and I don’t know if my build was the optimal list either. I was not able to find many videos on it, but I did see that Donald from Dark Integral Gaming actually just put out a video featuring Charizard yesterday, so you might want to check that out. I’m sure he’ll have three AWESOME matches for you 🙂 Mine were … well what’s the opposite of awesome? Yeah you can fill in the blank there. We close the week with Charizard (Dragon Majesty 3/70). This card has two obvious things going for it: 160 HP, and its “Resolute” Ability. Resolute increases the damage of “This Pokémon’s attacks…” by 30 for each Pokémon-EX/GX your opponent has in play, at least when Charizard is attacking your opponent’s Active, though it isn’t like Charizard can hit the Bench. The more-or-less neutral aspects of this card are that it has no Resistance, a Retreat Cost of [CC], and its attack, “Fiery Blast”. For [RRC], Fiery Blast lets Charizard do 130 damage, but you also have to discard an Energy from Charizard itself. Even with the discard, the damage solid for the cost, and if you have the right damage buffs, Charizard can hit OHKO range against your opponent’s Pokémon-EX/GX quite easily and besides Choice Band, we know Charizard has such a thing built in via Resolute. The catch is that [RRC] isn’t exactly easy to supply in Standard, even before factoring in a discard cost that means a Charizard that survives while Active – and we hope it does – will need another Energy to attack on your next turn. As for the bad, being a Stage 2 makes Charizard relatively slow and hard on deck space, while I do not fancy [W] Weakness right now, even if no [W] decks are currently both popular and potent; they have Aqua Patch! Charmeleon (Dragon Majesty 2/70) matters because of its Ability, “Burning Fighter”, which triggers when you Evolve one of your Pokémon in play into Charmeleon. This gives you the option of discarding the top five cards of your deck, and if any of them are [R] Energy, you attach them to this Charmeleon. Losing five cards from your deck is rough, but this can take a Charmeleon from zero to fully powered in a single move. You won’t want to attack with Charmeleon, of course, but hope it survives a turn so you can Evolve into Charizard… or even Charizard-GX! Though it’ll nearly obliterate your own deck, you could even attempt to Evolve multiple Charmeleon on the same turn; as long as two get at least [RR] attached to them, your opponent will be hard-pressed to prevent at least one Evolving the next turn. Charizard-GX isn’t exactly thrilling, but even [RR] from Burning Fighter and your manual Energy attachment for this turn and the next, mean on that next turn Charizard-GX can use its “Crimson Storm” attack to do 300 damage! If your opponent has the right field, though, you can have a much simpler time of things using today’s Charizard to swing big. That is for the Standard Format… I know you could also use Kiawe, if you use it on Charmander or Charmeleon your opponent has too easy a time going for a quick OHKO while using it on Charizard means a really, really slow open. Overall, it has some potential here, but remember plenty of decks run few Pokémon-GX. In the Expanded Format, you can just use Rare Candy on a Charmander who is ready to Evolve, then use Blacksmith to attach [RR] from the discard while attaching the third Energy manually. You can also slap on a Muscle Band in case your opponent doesn’t have any Pokémon-EX/GX in play; 130 + 20 takes out most things that are NOT Pokémon-EX/GX. There were no pre-releases for Dragon Majesty because the set wasn’t released in the usual manner; no individual booster packs or booster boxes, just things like gift sets. That means I’ll be giving a hypothetical Limited Format score; I don’t think you even can play a sanctioned Limited Event using this, but if you can or don’t mind playing informally, Charizard is alright. Charmeleon helps a lot, though discarding five cards from a 40 card deck is even more reckless, but if you have to attack with Charmeleon its “okay” here. Charizard probably won’t get much of a damage boost, but the 130 goes a lot further here as well.